100% spelt flour. Cracking good bite. 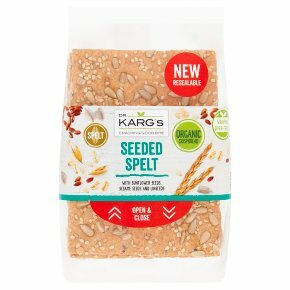 With sunflower seeds, sesame seeds and linseeds. Wrapped oven-fresh. Crispbread delight. High grain and seed content. High in fibre. Family bakery since 1950. No additives. Suitable for vegans.Crispy, crunchy, simply delicious! Only ingredients with the best flavour nature can offer give our crispbread its genuine taste. Made with German Baker's skills, every single slice is one of a kind. Certified organic quality.